The C-terminal domain (CTD) of RNA polymerase II (Pol II) extends from the catalytic core and consists of repeats of a seven-amino acid motif. The CTD functions in the regulation of Pol II function and is subject to just about every protein modification you can think of, including methylation, acetylation, ubiquitination, phosphorylation, and O‑GlcNAcylation (reviewed in Harlen and Churchman, 2017). These modifications affect mRNA capping, histone modifications, chromatin structure, and splicing, altering the recruitment of RNA-processing enzymes, transcription factors, and chromatin-modifying proteins to Pol II during transcription. Much to the relief of editors who can’t spell O‑GlcNAcylation (not naming any names), most work on the CTD has examined phosphorylation. Phosphorylation of different residues of the CTD affects the transition from initiation of transcription (unmodified CTD, interacts with Mediator complex) to elongation (phosphorylated CTD). CTD phosphorylation is regulated by kinases and phosphatases and perturbations of these enzymes affects the transcriptome. For example, Arabidopsis thaliana CTD PHOSPHATASE-LIKE 4 (CPL4) RNA interference lines (CPL4RNAi) show hyperphosphorylation of the CTD and changes in the levels of more than 200 transcripts. Fukudome et al. (2017) followed up on these studies, finding that GPI19, a gene strongly upregulated in CPL4RNAi, has an intriguing link to small nuclear RNAs (snRNAs). GPI19, which encodes a phosphatidylinositol N-acetylglucosaminyltransferase, contains a U12 snRNA in its 5′ untranslated region. 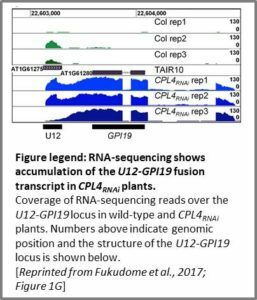 Wild-type plants produce a U12 pre-snRNA transcript, but CPL4RNAi plants produce a U12-GPI19 fusion transcript (see figure). Mutation of a conserved element downstream of the snRNA increased expression of a luciferase reporter (U12–LUC) and mutation of an upstream element decreased reporter expression, indicating that read-through from transcription of the U12 snRNA affects regulation of the downstream GPI19 protein-coding gene. 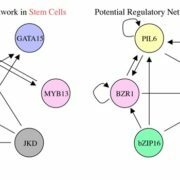 Rather than being an oddity restricted to GPI19, read-through occurs at other loci: the authors used RNA-sequencing of CPL4RNAi plants to show that many Pol II-dependent snRNA loci produce 3′ extensions in CPL4RNAi plants. However, protein-coding mRNAs and Pol III-dependent snRNAs did not produce 3′-extended transcripts. 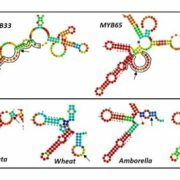 Many of these 3′ extensions of snRNAs produced a fusion to a downstream protein-coding gene. For example, LONG-AFTER FAR-RED 3 (LAF3) produces alternative transcripts, one initiating from an upstream snRNA and one initiating downstream of the snRNA; the former transcript accumulated in CPL4RNAi plants. Motifs associated with snRNA promoters also occur in transposable elements and these elements can affect the expression of protein-coding genes. For example, SMALL SCP1-LIKE PHOSPHATASE 14 (SSP14) has a snRNA-like promoter sequence in an upstream transposable element. In wild-type plants, the SSP14 locus produces only the 5′-part of coding region as an intermediate-length, unstable transcript terminated at an snRNA 3′-processing-signal-like sequence inside of the protein coding sequence. 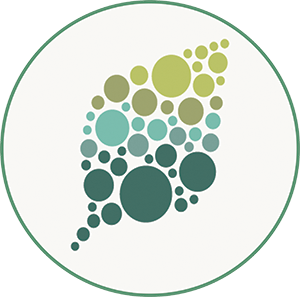 Also, the extended, full-length SSP14 transcript accumulates only in pollen, where high levels of read-through tend to occur, perhaps due to the low level of CPL4 expression. 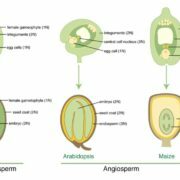 CPL4RNAi induces ectopic production of the full-length SSP14. 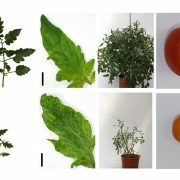 These results implicate this mechanism in tissue-specific regulation of gene expression and BLAST searches of other plant genomes indicated that such fusions occur widely in plant species, with some conserved combinations, such as U12-GPI19, and other combinations occurring by species-specific snRNA loci distributions in each genome. 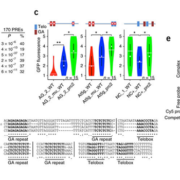 Read-through occurs as part of normal snRNA production; for Pol II-transcribed snRNAs, the CTD recruits the Integrator complex, which removes the excess 3′ RNA. 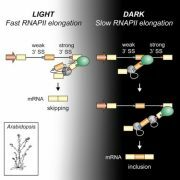 The observed accumulation of read-through transcripts requires the snRNA transcription and processing machinery, as a mutant affecting this machinery failed to accumulate snRNA fusion transcripts in CPL4RNAi plants. 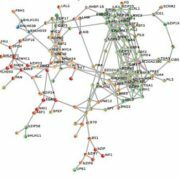 CTD phosphorylation also changes in response to environmental factors and the authors found, by searching microarray databases and examining RNA-sequencing data, that salt stress induced the accumulation of fusion transcripts. Indeed, immunoblotting showed that salt-stressed plants accumulated Pol II with reduced phosphorylation, in contrast to CPL4RNAi plants, which accumulated Pol II with increased phosphorylation. A closer analysis, using antibodies that distinguish phosphorylation on different amino acids of the CTD repeat combined with locus-specific analyses by chromatin immunoprecipitation showed that this apparent contradiction (since CPL4RNAi plants and salt stress produce similar effects on transcripts) occurs at the whole cell level, however, CTD phosphorylation profile at snRNA loci were consistent between CPL4RNAi and salt stress and accumulated Pol II with increased phosphorylation. 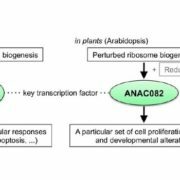 Although further studies will be required to explore the full implications of this study, the identification of read-through transcripts fusing an upstream snRNA to a downstream protein-coding gene provides an intriguing indication that this mechanism may have key regulatory functions in development and stress responses. Moreover, transposon-mediated rearrangements of regulatory sequences show yet another way that transposons can generate novel effects on gene regulation. Fukudome, A., Sun, D., Zhang, X., and Koiwa, H. (2017) Salt Stress and CTD PHOSPHATASE-LIKE 4 Mediate the Switch Between Production of Small Nuclear RNAs and mRNAs. Plant Cell 10.1105/tpc.17.00331. Harlen, K.M. and Churchman, L.S. (2017) The code and beyond: transcription regulation by the RNA polymerase II carboxy-terminal domain. Nat Rev Mol Cell Biol. 2017 Apr;18(4):263-273. doi: 10.1038/nrm.2017.10.